Not only is papaya a sweet tropical treat, it contains vitamins A, B, and C, potassium, lycopene and antioxidants that are all good for your skin. Adding papaya essential oil or puree to homemade soap is an easy way to nourish your skin and boost the healthy effects of the soap. Most soap recipes call for essential oil, but you can also substitute papaya juice or puree for part of the liquids. Start by cutting the fruit into chunks and dropping them into your blender. Pulse the fruit into a puree. Depending on how juicy the fruit is, you may need to add small amounts of water to eliminate large lumps. to complete the papaya juice, squeeze the puree through cheesecloth or a small-mesh kitchen strainer. Hand-milled soap is fast and simple, and it does not require you to handle lye. You need to grate 20 ounces of pure, unscented white soap or Castile soap. 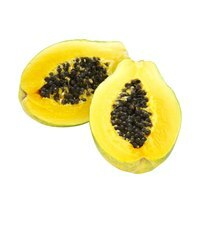 Mix it with 1 ounce of distilled water, 1 ounce of papaya puree and the contents of one vitamin E capsule. Melt the blend in a double-boiler and pour it into a mold. If you don’t want to invest in specialty soap molds, line a small cardboard box, mint or candy tin, or other similar container with waxed paper. Let the soap set up for 48 hours before removing it from the mold and slicing it, as necessary. Cure the soap by placing it in an airy place for two to three weeks. For a hand-milled soap using essential oils, melt 2 cups of shredded white soap, 1/4 cup water and 5 to 6 drops of papaya essential oil. Let it cool for about 20 minutes before forming small balls or pressing it into molds. Allow it to cure for three to four days. For this process, you need a few extra supplies. You'll need safety goggles and rubber gloves for working with the sodium hydroxide, or lye. You will also need an accurate digital scale, heatproof mixing bowls, double-boiler and immersion blender. Line a small cardboard box, like a shoebox, with waxed paper to use as a mold. Always add the lye to the water -- never pour water onto the lye, and mix. Set the mixture aside to cool. Meanwhile, mix the oils and a fragrance, if you are using it. Microwave them to melt the coconut oil. When the temperature of the oils and that of the lye mix are about 20 degrees apart, begin mixing them slowly, alternating to keep a stable temperature near 100 degrees. Use the immersion blender to blend the soap to the trace stage, which is when a drizzle of the soap leaves a trace, or trail, on the surface. Pour the soap into the mold, and allow it to set for 48 hours. Remove the soap from the mold. Slice it, and set it in an airy spot to cure for two to three weeks. Stir the honey into the papaya puree. Mix the lye into the puree. Again, always add the lye to the liquid, never the reverse. Mix and melt the oils. Slowly add the lye into the oils, and then use the stick blender to blend the soap to trace. Pour it into a mold, and let it set for 48 hours before slicing and curing.